Home Swift Messages What is Business Identifier Code (BIC) and International Bank Account Number (IBAN)? What is Business Identifier Code (BIC) and International Bank Account Number (IBAN)? How to use IBAN and BIC in international payments? How to find a BIC code? How to verify an IBAN number? Whatever your payment method would be, cash in advance, open account, cash against documents, letter of credit or bank payment obligation, you need to supply your bank enough “payments reference data” in order to complete your international payment successfully. “Payments reference data” are the sets of data that banks use when executing international money transfers. Money transfer regulations vary from one country to another. As a result different “Payments reference data” would be required when transferring funds between different countries. Business Identifier Code (BIC) and International Bank Account Number (IBAN) are two main “Payments Reference Data” definitions that you need to know regarding the international money transfers. Today I am going to describe these two terms in detail. Let us start with Business Identifier Code (BIC). Business identifier code is also known as swift code or swift address. Swift address term can be accepted as a more informal definition that is used by exporters and importers. Business identifier code (BIC) is a formal definition and preferred by the banking professionals. 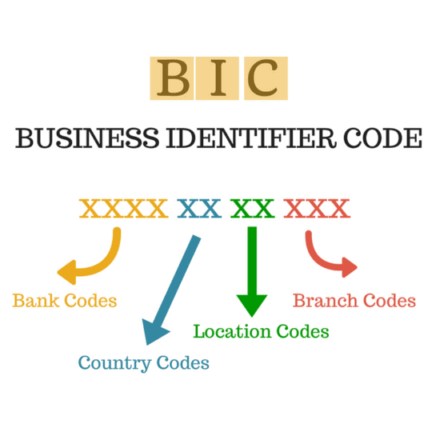 What is Business Identifier Code (BIC)? The Business Identifier Code (BIC) is a standard established by the International Organization for Standardization (ISO). The standard is known as ISO 9362. SWIFT is the registration authority of ISO BIC codes. As a result BIC codes can be assigned to financial and non-financial institutions only by SWIFT. The BIC can be defined as an address of an each bank branch in authenticated swift network. Each bank branch that is using swift network has a unique BIC code. What are the Types of Business Identifier Code (BIC)? A BIC8 identifies a financial or non-financial institution in a country or a location. A BIC11 identifies the institution’s branch. MIDLGB22 is the BIC code of HSBC BANK PLC UNITED KINGDOM (ALL U.K. OFFICES). The first four characters in BIC code identifies the bank. In this example MIDL identifies HSBC BANK PLC. According to BIC standards the first four characters must be alphabetic characters only. The following two characters identify the country where the bank is located. In this example GB identifies Great Britain. According to BIC standards these two characters have to be the ISO country code consists of two alphabetic characters. Last two digits in BIC8 code is the location code, which provides geographical distinction within a country, such as a city, state, province or time zone. In this example 22 identifies London. The location code consists of two characters that can be alphabetic or numeric. BIC11 is the BIC codes of the bank branches. BIC8 can be extended to an 11 character BIC by adding a branch code. MIDLGB2103J is the BIC code of Market Hill Branch of HSBC Bank PLC, Cambridge, United Kingdom. What is International Bank Account Number (IBAN)? 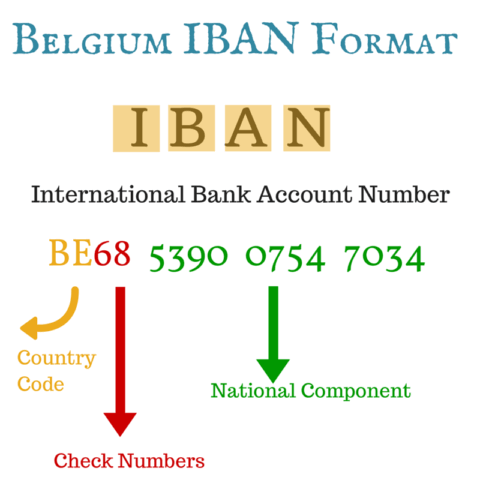 IBAN is the acronym of International Bank Account Number. IBAN is an ISO 13616 standard which is created for numbering bank accounts. SWIFT is the designated “Registration Authority” for ISO 13616 standard since 2006. What are the Types of International Bank Account Number (IBAN)? All International Bank Account Numbers have the same structure. Only the length of the IBANs changes from one country to another. Within the same country all IBANs have the same length. For example all IBANs in Belgium contain 16 characters, whereas all IBANs in Germany consist of 22 characters. But the main structure of the IBAN is the same in all countries. DE89 3704 0044 0532 0130 00 is an IBAN number from Germany. The first two characters of an IBAN number is the country code. IBAN country codes are derived from ISO country codes. DE represents GERMANY. The two following characters are check numbers. Banks check the IBAN number with the help of these two check numbers in order to avoid erroneous payments. Remaining characters are the identifiers’ of the national bank account. Its format and length varies between countries. National bank account identifiers are also called as Basic Bank Account Number (BBAN). BBAN is the identifier that uniquely identifies an individual account, at a specific financial institution, in a particular country. The BBAN includes a bank identifier of the financial institution servicing that account. IBAN formats are submitted to the Swift registration authority exclusively by the National Standards Body or the National Central Bank of the respected country. For example German IBAN structure has been submitted to the SWIFT by Association of German Banks, whereas Belgium IBAN structure has been submitted to SWIFT by Belgian Bankers’ Association. Do you want to learn how to use the International Bank Account Number (IBAN) and the Business Identifier Code (BIC) when making your payments in international trade. Please have a look at above educational video, which was created by EPC. How to Use IBAN and BIC in Open Account and Cash in Advance Payments? The exporter should identify his bank’s BIC code or swift address on the proforma invoice or sales contract along with his company’s official name, his bank’s name, his bank’s branch name. The exporter should also indicate his bank account number or IBAN number on the proforma invoice or sales contract as well. How to Use IBAN and BIC in Documentary Collection Payments? 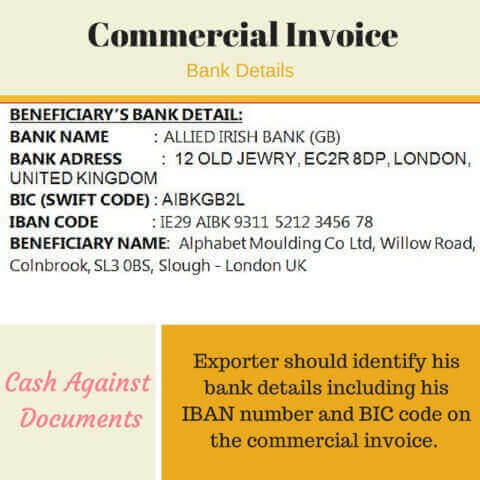 In a documentary collection payment method, the exporter should identify his bank details including his IBAN number and BIC code on the commercial invoice. How to Use IBAN and BIC in Letters of Credit? Issuing banks identify their BIC codes on the “message header” section of the MT 700 swift messages under the title of “Sender”. Issuing banks also identify the advising banks’ BIC codes on the same area under the title of “Receiver”. Nominated banks’ BIC codes are stated under the “Field 41a: Available With … By …”. Issuing banks sometimes identify IBAN numbers of the beneficiaries under the field of “57a: ‘Advise Through’ Bank”. Previous articleWhat does a non-documentary condition mean?